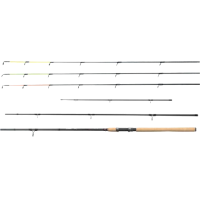 Feeder fishing rod with a modern look: rod made from high modulus carbon with a perfect action and sensitive tips. Portuguese quality cork handle, reinforced cross over closure, reel seat with padded poles clamps, superhard guide eyes, epoxy coating. Supplied with 1 yellow, 1 green and 1 red carbon top.